Type Mohamed Salah’s name into Facebook, Twitter or Instagram's search bar now, and you won’t find the football star’s official social media accounts there anymore. Salah’s fans were baffled to find that he had deleted his presence from social media on Wednesday, 23 January, but not before leaving one last cryptic tweet behind. 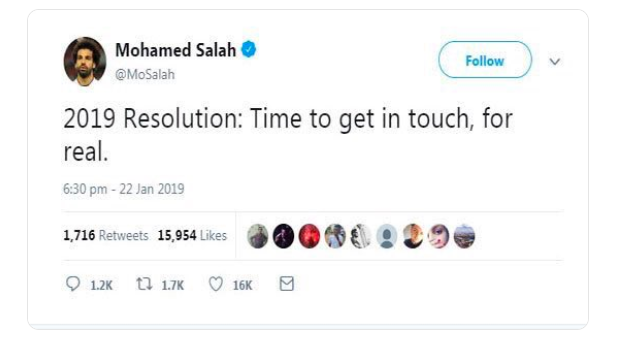 “2019 Resolution: Time to get in touch, for real,” his final tweet read, leaving fans curious as to what exactly the Liverpool striker's words meant. Some came up with the theory that Salah deleted his accounts due to his dispute with the Egyptian Football Association over his image rights, while others simply took his tweet - and accordingly, his decision to delete his accounts - for what it is: a new year’s resolution. The Egyptian footballer is one of the most sought-after players in the world. Earlier this month, he was named the African Player of the Year for the second year running.